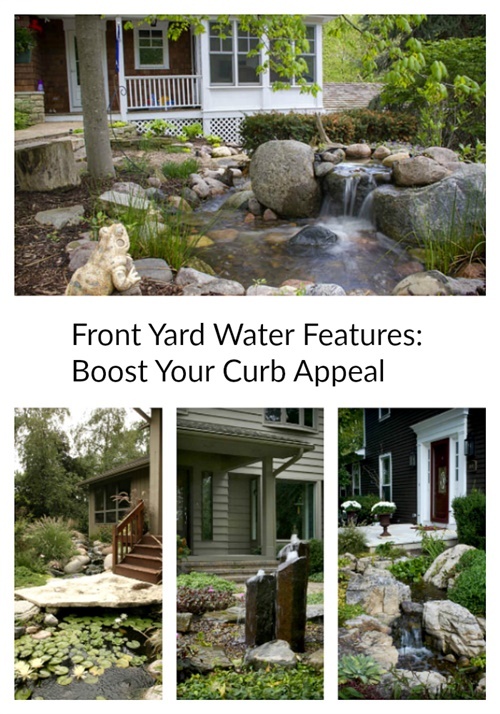 Front Yard Water Features: Boost Your Curb Appeal - Aquascape, Inc.
You’ve probably seen breathtaking photos of backyard ponds bobbing with colorful water lilies, and maybe you’ve been lucky enough to see one in person or even have one of your own. But why limit beautiful water features to the backyard? 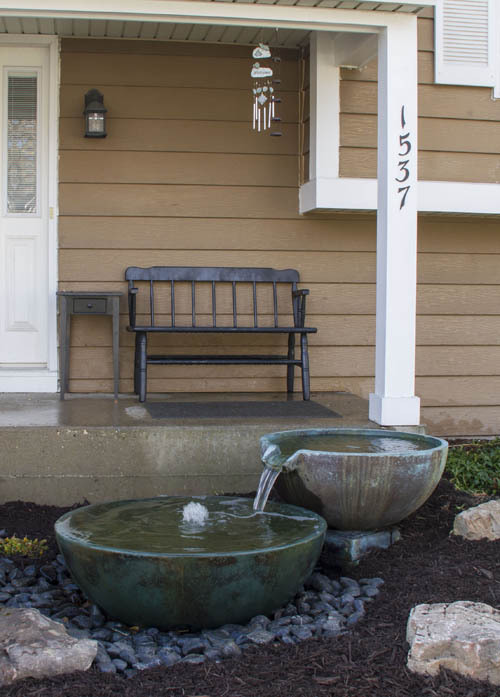 It’s just as easy to enjoy front yard water features and boost your curb appeal at the same time! An ecosystem pond takes center stage at the entrance to this suburban Colonial home. Adirondack chairs provide comfy seating for watching the fish and enjoying nature. On the other side of the door, the water feature continues along the sidewalk with a gentle waterfall. The perfect landscape enhancement for greeting visitors to your home. Look carefully and you’ll notice the stream that begins near the front door, winding its way along the pathway before emptying into a pretty koi pond. Maybe a fountain is more up your alley due to its smaller size. This little foursome of fountain rocks is nestled in a bed of impatiens by the front door. Birds enjoy getting a drink here while resting their wings from flight. 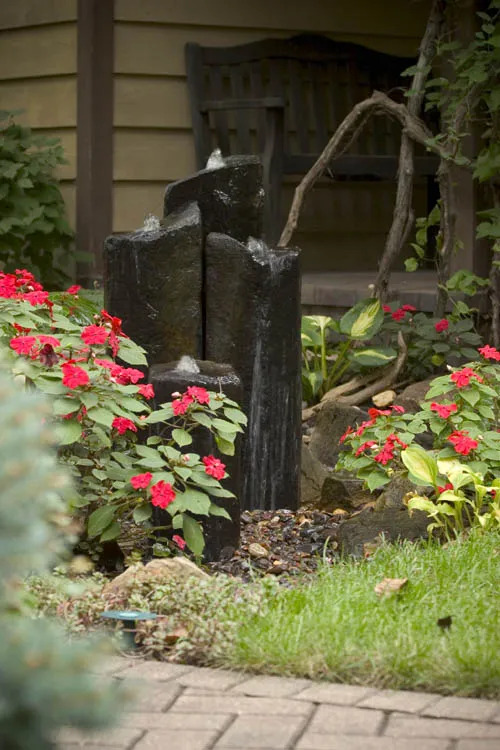 Flowers can be challenging to grow in shady areas, but a fountain is the perfect spot for such a location! This home already has a stunning backyard pond, but the owner wanted a splash of water out front, too. You’ll be the envy of the neighborhood with a waterfall and pond that requires a stone bridge to traverse it to reach the front door. Waterlilies play on the surface of the water when the breezes blow. A small waterfall nestles in the ivy and hostas next to the front steps of this Chicago suburban home. A koi lover wanted their pond at the front of the house to match their indoor koi pond in the meditation room. A frog statuette guards this home’s recirculating waterfall and hints at the critters that live to visit and enjoy the oasis. To really amp up your curb appeal, consider bowls spilling one into another. You could even make a chain of bowls that extend the length of your sidewalk.